I grew up absolutely LOVING the Tim Curry TV miniseries version of Stephen King's IT. Then I went and saw the first installment of the new movie version coming to theatres, which was so different from the miniseries, and knew I needed to see how the two compared to the original story. 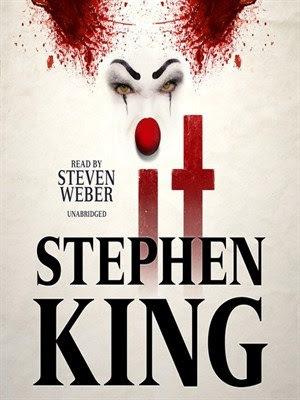 Lucky me I spotted an audiobook version available to borrow from my library and thought it would be the perfect opportunity to see how Stephen King intended the story to unfold. I'm not afraid to admit that the audiobook version of IT was as terrifying as I imagined it would be! Anyone who reads, watches, or listens to horror stories most likely already knows the basic premise of IT. If you don't the synopsis above will fill you in. This is a story about visceral and all-consuming fear. It's an evilness that has lurked below this small town for centuries and a group of teenagers who set out to destroy it once and for all. It's mind-bending and nightmare-inducing and a consuming story, especially when experienced as an audiobook. It also, surprisingly enough, has mixed in to it this touching coming-of-age and first love story that would seem out of place in less capable hands than Stephen King's. It really does have something for everyone, as long as readers or listeners are able to handle some graphic language and situations. Steven Weber as narrator for this story is perfection. He has this wonderful speaking voice that is great for narration as well as this ability to change his voice for the various characterizations and really inhabit the insanity that is Pennywise (the clown personifying the evil). He has this way of speaking, this low-burning growl and terrifying shrieking quality, that made Pennywise so scary that I could feel my heart begin to race when he entered a scene. I was amazed at how well he read this long and multi-layered story and really want to find some other audiobooks narrated by him. As you can see above, this is a LONG story. It was so long, in fact, that I had to check it out from my library in two installments (only being allowed to check it out for two weeks at a time). Because it's so popular these two separate rentals were literally months apart. My eagerness to finish the story was so great, though, that I happily waited for the book to become available again and then put everything else aside to make sure I could finish it the second time around. And I don't regret a minute of it. The story never dragged and every minute of the almost 45 hours felt needed to fully tell this story. I don't think I've ever devoted this much time and energy into a story before and felt this satisfied at the end. IT might be my favorite audiobook experience to date (Locke and Key is hard to beat) and is definitely the best audiobook version of a novel I've come across. The combination of an excellent horror story and an exceptional narrator are hard to resist and anyone who's been thinking of giving this story a try, as I was, need to run out and get your hands on a copy. I've read a few stories by Stephen King and very much enjoyed them, and this is no exception. He's considered by many to be the master of horror and it's not hard to see why. This cover doesn't really do much for me, however I've seen some more recent covers that give you more of a chill befitting this terrifying story. To be honest I would have picked up this audiobook regardless of the cover so I didn't really care about what it looked like for once! I borrowed a copy of IT from my library's Overdrive account. All opinions are mine alone. To find out more about the book, including other reviews and links to where you can purchase a copy, see Goodreads HERE.